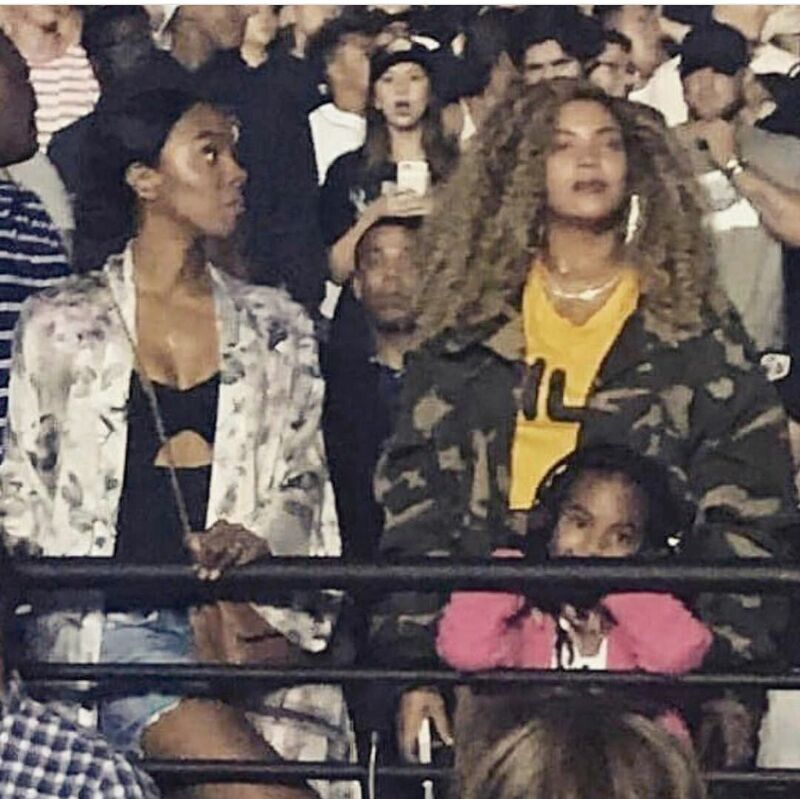 Beyonce, Blue Ivy and Kelly Rowland totally lost it during Kendrick Lamar’s concert in L.A. last night. Peep the ladies turning up, plus deets on Yara Shahidi’s father’s new Prince project inside…..
Life after the birth of twins, Rumi & Sir Carter, is all good for Beyonce. The YBF superstar has been living it up on the west coast since the birth of her new bundles of joy. After sharing a cute clip of her post-baby bawdy at the World of Wheels skating rink, Bey ade her way to the Staples Center to check out Kendrick Lamar on his DAMN tour. And she brought her baby girl Blue Ivy and her bestie Kelly Rowland along with her. Bey, Blue, Kelly and Bey’s cousin Angie Beyince was turned ALL the way up, jumping up and down during K-Dot’s performance of “Alright” and “Humble.” We all know K-Dot is the homie. He’s featured on Bey’s “Freedom” track from her LEMONADE album and he also helped rock the stage alongside Mrs. Carter at the BET Awards last year. Blue Ivy in Los Angeles! Blue was spotted looking super stylish while out in L.A.
Yara Shahidi’s dad Afshin Shahidi is gearing up to give Prince fans a closer look at his life. If you didn’t know, Yara’s dad was Prince’s personal photgrapher for 10 years and they were friends for over 20 years. Now, he’s about to release a new book of photographs of the musical icon titled, “Prince : A Private View,” and Beyonce did the honors of writing the foreword. “Truth be told, the word ‘icon’ only scratches the surface of what Prince was and what he remains to me,” Bey writes (via EW). “Prince: A Private View” will include intimate, candid and staged never-seen-before photographs of the late singer. It’s expected to be released October 17th. Nice!